The static version of 2D Frame Analysis software is now available. 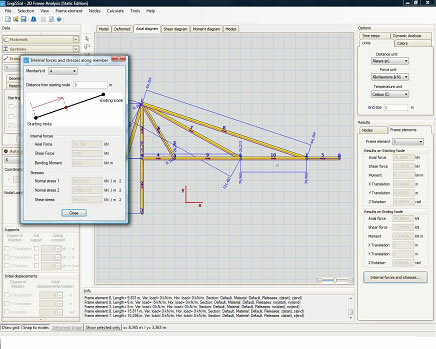 The most popular software for sttructural analysis of frames and trusses! Easily solve any plane frame or truss easy, fast in a reliable way. All loading types handled, standard cross sections database, any kind of dof releases, drawing of axial/shear force and bending moment diagrams are some of its features. 2D Frame Analysis Static Edition can handle any 2d frame or truss and provide its internal forces/moments diagrams, calculate nodal displacements and displacements along elements and finally produce top quality calculation reports ready to be printed. Its has been used so far by thousands of engineers for the every-day structural problems and can handle simple structures like a beam or complex large frames with/without braces, def releases, complex loads etc. Moreover it features a sophisticated, full interactive user interface, every actions can be taken using only the mouse. It is offered at the lowest market price, you can get the chance to try it!